Street vendors with moveable kiosks have become an indispensable staple to New Yorkers. Surprised by rain, a chill in the air or tired feet, one doesn’t have to walk far to be rescued by an inexpensive umbrella, scarf or, in summer, flip flops. 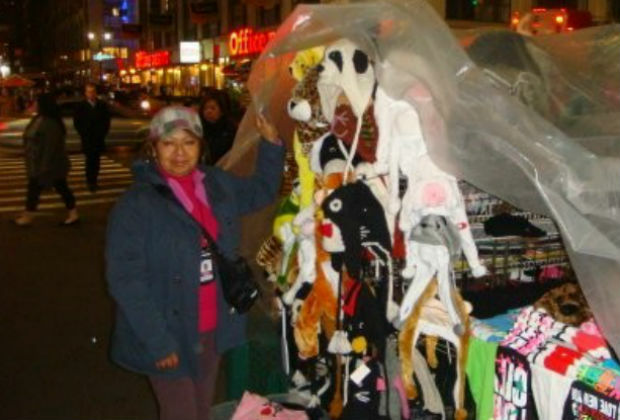 What is unusual is to find a woman as the proprietor, but on the corner of 41st and 7th Avenue you will find Soledad Pabon. A single mother of two, Soledad left Peru at the age of 28 and came to America in search of a better education for her two daughters. Now nearly three decades later, she owns her home in New Jersey and her daughters Alicia and Fiorella—whom she put through private school and college—are successful professionals, working as an immigration attorney and an analyst, respectively. Soledad accomplished this impressive feat by hard work and pluck. She began by selling water and soda at a park in Flushing Meadows Park in Queens, New York while her young daughters played. From there she moved on to her first street cart at 34th and 6th Avenue selling toys during the holiday season. Tired of being arrested for work that wasn’t yet regulated by the government, she was among the first to apply for an official street vendor license by New York City when they launched the program in 1992. Thirteen years and $210 later, she obtained her license. After the licensing fee and other setup costs of several hundred dollars, Soledad was in business! The work is hard, seven days a week from 10am to 10pm. Asked how she finds time to buy her merchandise, she explained that the wholesalers who sell to street vendors open at 5 a.m. When asked if she would ever do anything else, she replied, “Absolutely not. I couldn’t work for anyone else”. She loves being her own boss as well as being an active member of the supportive community of street vendors—in fact, two of her colleagues hovered as I interviewed Soledad, ensuring that I meant no harm. Remarkably, Soledad and several of her colleagues find time to help others through the organization, Street Vendor Project. The Project was formed to encourage New York City to issue more licenses and encourage street vendors to organize. If successful, issuing additional licenses could lower the sales of existing vendors. In response Soledad said “en la calle hay pan para todos“, which translated means “in the street there’s bread for everyone”. “It is the right thing to do for the economy given the jobs crisis”, she explained. How many of us have enough heart and extra income to share at the end of a 12 hour day? Our world needs more Soledads—doing her part to make it possible for others to work.